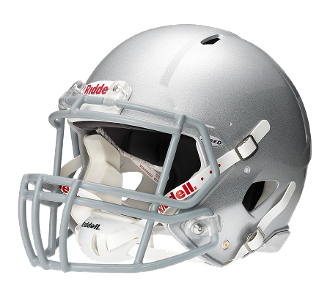 The Riddell Revolution Speed Youth Football Helmet is a top of the line helmet designed for youth through the middle school level football players. The Riddell Speed Youth shell is made from high impact ABS plastic designed to take on all of the hits taken on the gridiron up to age 13. The high performance shell combines with an aggressive, elite look that allows any player to take the field with confidence. Because fit is the most paramount aspect in wearing a football helmet, the youth speed is equipped with inflatable liners and pads as well as inflatable S- jaw pads to allow for a custom fit for every player. On top of fit and technology, the Riddell Youth Speed helmet also takes comfort and cleanliness in to account. The moisture wicking over liner provides a great feel combines with anti-microbial properties to keep you comfortable and sanitary throughout the season. Look good, feel good and play great with the Riddell Revolution Speed Youth Football Helmet!